Note: Initial data tables received on Jan. 18, 2019 reflected data from Dec. 5, 2017 for the 2018 columns, before the transfer application extension, and updated tables received on Jan. 25, 2019 reflected data from Jan. 9, 2018 which reflected applications through the transfer application extension. This change was not noted until after this story was published. It has been corrected. We regret the error. The UC Santa Cruz admissions team doesn’t just recruit students—they help create the campus’s next generation of alumni. “When we develop our recruitment plans and work with our faculty senate committee on admissions and financial aid to finalize our admission policies, the focus of our conversations is all about enrolling students representing excellence and diversity who will become our future alumni,” said Michelle Whittingham, the associate vice chancellor for Enrollment Management. The campus marked the first step toward building the Classes of 2021 (transfer) and 2023 (first-time), receiving 67,262 applications for fall 2019 enrollment. The campus saw nearly the same number of students wanting to transfer from a California community college, continuing the strong outcome built in the past several years. The admissions team is now reviewing applications—evaluating students’ academic achievements and preparation in light of the opportunities available to them and their demonstrated capacity to contribute to the vitality and intellectual life on-campus. Undergraduate applicants will be notified of admission decisions and waitlist invitations beginning mid-February, with the majority beginning mid-March. Admitted first-year students have until May 1 to indicate their intent to enroll and transfers have until June 1. In 2018–19, UC Santa Cruz fulfilled a state requirement to enroll one California transfer student for every two first-year students from the state. The campus’s exceptional efforts to attract transfer students led to a transfer pool with 10,138 California students, a 15 percent increase from 2017, yet similar to 2018. In total, the campus received 11,729 transfer applications. 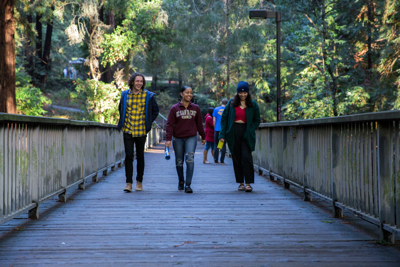 UC Santa Cruz received applications from 55,533 students seeking to be new first-year students for fall 2019, a 1.3 percent decrease from the previous year. Within that, the campus received 44,354 applications from California residents, a 3.3 percent decrease from last year, partially due to the expected decrease in California high school grads from 2018 to 2019. California high school graduates are projected to decline from 435,000 in 2018 to 431,000 in 2019, according to the Western Interstate Commission for Higher Education (WICHE). The campus’s blend of high-impact research with tight-knit communities of learning—the 10 residential colleges—continues to be attractive for students from other states and countries. Freshman applications from international students increased by 12.5 percent, and domestic out-of-state applications slightly declined. Transfer applications from international students increased by 6.8 percent and domestic out of state increased by 4 percent. The campus also continued to see interest from ethnically diverse California students with this year’s figures in line with last year’s. Of California freshman applicants, 5 percent are African American; 32 are Asian American; 36 percent are Chicano/Latino; 0.5 percent are American Indian and 24 percent are White. Of the California community college applicants who are not international, 6 percent are African American; 27 are Asian American; 0.7 are American Indian; 32 percent are Chicano/Latino; and 31 percent are White. U.S. News and World Report ranked UC Santa Cruz at No. 26 in a list of best universities for undergraduate teaching. The magazine also put the campus among the top 30 public universities in the nation.